Lower limb prosthesis performance determines the quality of life of amputee patients. Such performance will benefit from a feedback informing the patient about the gait phase and the overall condition of the foot. This study reports the design and validation of a wearable haptic feedback system conceived to assist lower-limb amputees in various locomotion scenarios. Three vibrating motors were attached to a belt in textile to provide information about the foot-ground contact, by remapping the variables detected under the foot, on the waist of the user. Multiple activation patterns were implemented and compared in a pilot study involving one able-bodied subject, during walking, ascending and descending stairs. A novel assessment protocol was proposed to benchmark the different stimulation patterns. The protocol resulted to be a viable method for quicker development and testing of new strategies. 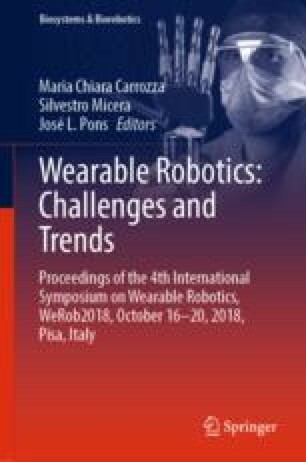 This work was supported in part by the EU within the CYBERLEGs Plus project (H2020-ICT-2016-1 Grant Agreement #731931) and in part by the Italian National Institute for Insurance against Accidents at Work (INAIL Centro Protesi, Budrio) within the MOTU project.